The rather severe-looking Duo Enßle-Lamprecht concentrates on newly commissioned music and the very early repertoire. For this recording, they explore pieces drawn from a number of medieval manuscripts, including Can vei la lauzeta mover by the 12th-century Bernart de Ventadorn (the only vocal piece on the recording), La Quinte Estampie Real from the 13th-century Manuscript du Roi, Eya herre got was mag das gesein and Stabat mater from the 13th-century Castilian Las Huelgas Codex, an Alleluja from the Swiss Codex Engelberg (c1375), three pieces by the enigmatic 14th-century ‘Monk of Salzburg’, the early 15th-century Codex Faenza, and the famous British Library MS.Add.29987 with its enormous collection of 14th-century Italian music. Performing medieval music is always a bit of a minefield. There isn’t much of it, and what there is leaves very little indication of how it should be played. Evidence for instrumentation tends to come from the occasional literary reference, or from artworks of the time. 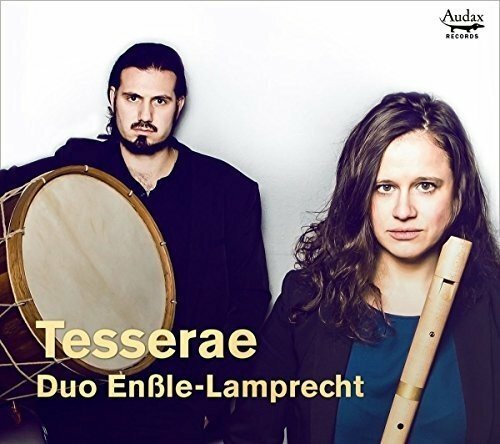 There is little information about the specific instruments used but, judging from the photographs in the booklet, Anne-Suse Enßle plays medieval-style flutes (including a Greek-style double-flute) and a variety of recorders. Philipp Lamprecht plays a wide variety of percussion instruments, including prominent bells, a glockenspiel. Fortunately, he manages to avoid the excesses of many percussionists in when playing this repertoire. The arrangements are attractive and persuasive, with a pleasantly improvisatory feel. The attractively packaged Audax CD includes notes on all the individual pieces in German, English, and French, written by Susanne Ansorg. The relevance of the title of ‘Tesserae’ (usually referring to the tiny individual elements of mosaic) is not immediately apparent, but I might have missed something obvious.